A game of chase played online and on the streets. Along with Botfighters, Can You See Me Now? is one of the first location based games. Online players compete against members of Blast Theory on the streets. 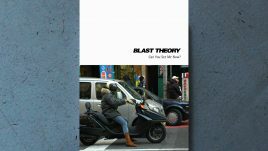 Tracked by satellites, Blast Theory's runners appear online next to your player on a map of the city. On the streets, handheld computers showing the positions of online players guide the runners in tracking you down. With up to 100 people playing online at a time, players can exchange tactics and send messages to Blast Theory. 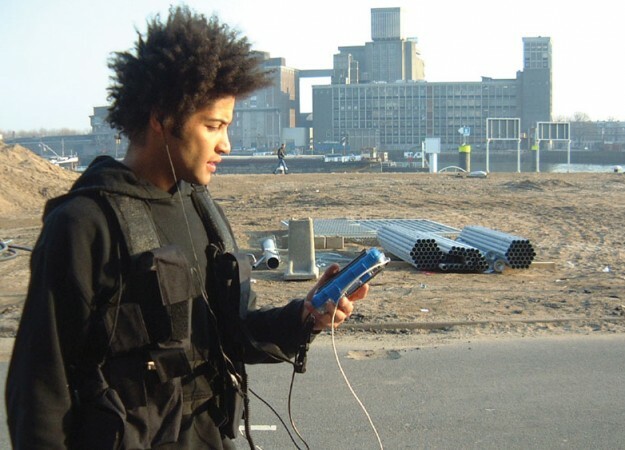 An audio stream from the runner’s walkie talkies allowed you to eavesdrop on your pursuers: getting lost, cold and out of breath on the streets of the city. Can You See Me Now? is the second major collaboration with the Mixed Reality Lab at the University of Nottingham after Desert Rain. As well as winning the Prix Ars Electronica this work was nominated for a BAFTA in Interactive Arts. It was developed during a long period of research and development in London and Nottingham exploring Global Positioning Systems and wireless networking. Steve Benford, Martin Flintham and Rob Anastasi from the Lab made particularly significant contributions to this work. Can You See Me Now? takes the fabric of the city and makes our location within it central to the game play. The physical city is overlaid with a virtual city to explore ideas of absence and presence. By sharing the same ‘space’, the players online and runners on the street enter into a relationship that is adversarial, playful and, ultimately, filled with pathos. As soon as a player registers they must answer the question: “Is there someone you haven’t seen for a long time that you still think of?”. From that moment issues of presence and absence run through the game. This person – absent in place and time – seems irrelevant to the subsequent game play; only at the point that the player is caught or ‘seen’ by a runner do they hear the name mentioned again as part of the live audio feed from the streets. The last words they hear is the runner announcing their catch, referring to them by the name of the person they haven’t seen for a long time. Using your arrow keys you explore the virtual city, all the while trying to avoid the runners. If they get too close you are caught and knocked out of the game. It is the simplest and most primal of playground games with the added twist of the players stretched across physical and virtual space. Proximity and distance exist at five levels in the game. Firstly, any game of chase is predicated on staying distant from your pursuer. Secondly, the virtual city (which correlates closely to the real city but is not an exact match) has an elastic relationship to the real city. At times the two cities seem identical; the virtual pavement and the real pavement match exactly and behave in the same way. At other times the two cities diverge and appear very remote from one another. For example, traffic is always absent from the virtual city. Thirdly, the internet itself brings geographically distant players into the same virtual space. It also enables those players to run alongside the runners as it streams their walkie talkie chat. Fourthly, the name of someone you haven’t seen for a long time but you still think of brings someone from the player’s past into the present: their name is spoken aloud by a runner on the distant streets of the city and exists for a seconds before fading into the ether. Finally, the photos taken by runners of the empty terrain where each player is seen are uploaded to the site and persist as a record of the events of each game. Each player is forever linked to this anonymous square of the cityscape. With the advent of virtual spaces and then hybrid spaces in which virtual and real worlds are overlapping, the emotional tenor of these worlds has become an important question. In what ways can we talk about intimacy in the electronic realm? In Britain the internet is regularly characterised in the media as a space in which paedophiles ‘groom’ unsuspecting children and teenagers. Against this backdrop can we establish a more subtle understanding of the nuances of online relationships. When two players who know one another place their avatars together and wait for the camera view to zoom down to head height so that the two players regard one another, what is going on? Is this mute tenderness manifest to anyone else and should it be? The work was premiered in Sheffield at the b.tv festival. Other venues include the Dutch Electronic Arts Festival in Rotterdam; the Edith Russ Site for Media Art in Oldenburg; the International Festival for Dance, Media and Performance in Köln; Gardner Arts Centre in Brighton; ArtFutura in Barcelona; the InterCommunication Center (ICC), Tokyo; Interactive Screen at the Banff Center, Canada; Museum of Contemporary Art in Chicago; We Are Here 2.0 in Dublin; Donau Festival in Austria; In Certain Places in Preston; Machine-RAUM in Denmark; Picnic Festival in Amsterdam; Arte.Mov in Belo Horizonte, Brazil; ARCO in Madrid and at Tate Britain. Can You See Me Now? 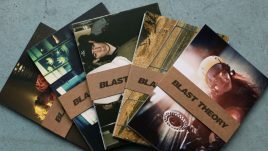 is a collaboration between Blast Theory and the Mixed Reality Lab, University of Nottingham. It was commissioned for Shooting Live Artists – a strategic initiative by Arts Council England, BBC Online and b.tv/The Culture Company – in 2001 and was first shown at the b.tv festival in Sheffield on 30 November and 1 December that year. Subsequent presentations in Europe have been supported by The British Council and UK presentations in 2004 and 2005 are supported through Arts Council England’s Grants for the Arts programme. Here’s one story that I should share about performing in Can You See Me Now? When we were in Cologne we did one game that lasted until midnight. As the last few minutes ticked away I was running through a rundown and – at that time – deserted industrial area. An estate pulled up in front of me, four men got out, picked me up and thew into the boot of the car. They drove off with me at high speed as I fought with them lying in the back of the car. They drove to a nearby garage to buy beer and to take my walkie talkie so that they could broadcast to online players. They soon realised they were out of range and had just started to drive back when one of the front tyres of the car burst and they skidded to a stop. To cut a long story short (running, chasing, bottles thrown), I got away from them by shouting ‘Hilfen!’ at the top of my voice. Then I had the challenge of convincing our hosts not to call the police on them. It turned out they were avid players of the game and thought it was a fitting climax to the Cologne version. That is a wonderful story of great player improvisation!